Basil, or Sweet Basil, is a common name for the culinary herb Ocimum basilicum (pronounced /ˈbæzɪl/ or, in the US, /ˈbeːzɪl/), of the family Lamiaceae (mints), sometimes known as Saint Joseph's Wort in some English-speaking countries. 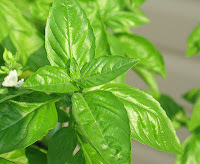 Basil, originally from India, but thoroughly familiar to Theophrastus and Dioscurides, is a half-hardy annual plant, best known as a culinary herb prominently featured in Italian cuisine, and also plays a major role in the cuisine of Taiwan and the Southeast Asian cuisines of Indonesia, Thailand, Vietnam, Cambodia, and Laos. Depending on the species and cultivar, the leaves may taste somewhat like anise, with a strong, pungent, often sweet smell. There are many varieties of Ocimum basilicum, as well as several related species or species hybrids also called basil. 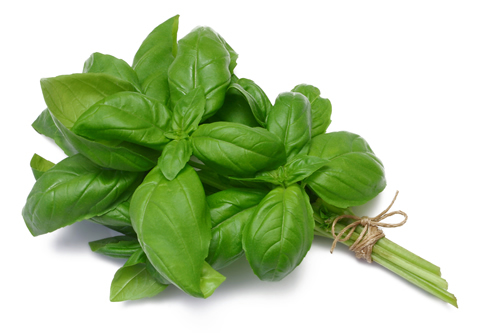 The type used in Italian food is typically called sweet basil, as opposed to Thai basil (O. basilicum var. thyrsiflora), lemon basil and holy basil (Ocimum tenuiflorum), which are used in Asia. While most common varieties of basil are treated as annuals, some are perennial in warm, tropical climates, including holy basil and a cultivar known as 'African Blue'. 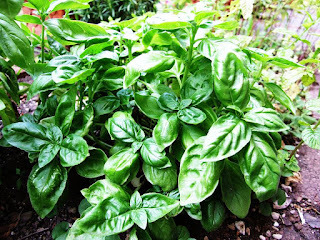 Basil is originally native to India and other tropical regions of Asia, having been cultivated there for more than 5,000 years.